These pen portraits build up into a gallery of special people. These people have made unique contributions to popular culture. Some of the stories will be fairly familiar, and some may seem slightly strange. There are some glaring omissions, and some odd inclusions. A thread of narrative runs through, and it’s all as subjective as hell. With the benefit of hindsight it is difficult to see why beyond punk we made such a big thing of independent labels. It was no big deal. Independent labels had been going for years. Series like the excellent Eccentric Soul one lovingly curated by the Numero Group show how central independent labels were to soul and funk music, and the same can be said of folk, reggae, jazz, and just about everything else around the world. Alan Horne’s a strange figure, and words like burlesque, roue, and reprobate spring to mind. He’s boyish, chubby, becropped, bespectacled, not very rock’n’roll, but totally pop. Full of mad ideas, at any other period of history he would have become a millionaire, or at least an outrageous Warholy multi-media celebrity, celebrated in Tom Wolfe-style journalism. If Postcard had something other labels were missing it was a single-minded determination and clarity of vision. Horne desperately wanted to succeed. One of the key elements of the Postcard approach was its symbolism and subversiveness. 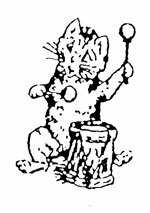 Its symbol was a cute kitten beating a drum, based on an early twentieth century Louis Wain illustration. At the time it was genuinely radical in its playfulness, going against the macho rock stereotype. The cat would in turn grow into a panther at Swamplands, the label London funded Horne to run briefly and messily in the mid-‘80s, but that’s another story. Another central element of the Horne/Postcard thing was almost a cowboy theme, with the checked shirts, all the old suede jackets, the Davey Crocket hat Edwyn Collins would wear, 'Blue Boy' coming on like the theme to Bonanza, the absurd tinges of country in the music. And that’s cowboys as in riding across the plains to rescue pop in time honoured tradition. Then symbolically there was Montgomery Clift in the western Red River, famous for the fight with boorish bully John Wayne. Monty was big around that time, with lots of us reading Patricia Bosworth’s biography, and loving both Monty in A Place In The Sun and the Stevie Wonder song of the same name, and genial Joe Strummer singing 'The Right Profile', and later Edwyn’s quiff, which was pure From Here To Eternity, from which there was that still that Dexys used for 'There There My Dear' where he’s raised the bugle to his lips, and then Postcard second generation genius Roddy Frame sang 'The Bugle Sounds Again'. There was too the sort of tongue-in-cheek Scots nationalism, The Sound of Young Scotland tagline adapted from Motown, and the camping it up as Scots gentry at a time when Thatcherism was rejected outright in Scotland. And there is an irony here as Alan Horne was almost the archetypal young entrepeneur, thrusting and dynamic, and so keen to succeed. Even if he did go about things in a peculiarly perverse way. Postcard was about pop going beyond music, and initially economics dictated there would be hand coloured, hand folded sleeves, the personal touch and not loaded by mothers in factories. Something beyond the norm, a little more thought going into the whole thing, with inventively-designed sleeves, and pictures on the labels of 7”s like on Vic Godard’s 'Split Up The Money', making the records objects of desire when others were following set rules, pre-ordained procedures. One of the early attractions of the early punk independents like Factory, Fast, and New Hormones was that they went beyond the standard vinyl format. And so one of the great Postcard achievements was the brochure Alan Horne put together for 1981, telling the story of Aztec Camera, Go-Betweens, Josef K and Orange Juice. Pre-Postcard Scotland could be deemed something of a punk wilderness. The glorious exception was Edinburgh’s Scars, and their antagonistic show-off stance was a massive influence on the nascent Postcard. Scars would record for Fast Product the outrageous 'Horrorshow' single in 1979, where a blatant disco influence was offset against the sharpest guitar sound ever. What was fascinating here was that groups like the Pop Group were talking about bespoke funk but Scars were picking up on the high street disco Saturday Night Fever disco thing, the populism that appealed to Postcard. From this distance the disco influence on Postcard was more fascinating than the Velvet Underground dimension. The underlying disco dimension to Postcard was very much the utilitarian, protean, pre-teen, pro-teen memories of youth club discos rather than the contemporaneous cutting edge music being played in certain clubs. George McCrae, Candi Staton, O’Jays, Trammps, Tavares, and the unprepossessing and ubiquitous compilations of the time, like Souled Out, Super Bad, and Black Explosion helped shape the sound of Orange Juice in particular. Then there was the Northern Soul thing via the then current incarnation of Vic Godard and Subway Sect and Pye’s Disco Demands which were raids on its own back catalogue to cash in on the Northern Soul scene. At random, you’d be thinking of Robert Knight’s 'Love On A Mountain Top', Tony Clarke’s 'Landslide', the Tams and Tami Lynn, 'I’m So Glad' by The Fuzz. And back to the Postcard present, a very explicit link was drawn between the rhythm guitar work on Chic’s recordings and the Velvet Underground live in 1969. Edwyn said he wanted Orange Juice to be a cross between the Pop Group and the Chic-created 'Spacer' by Sheila B Devotion. Alan Horne said the Pop Group’s 'She’s Beyond Good and Evil' was the ultimate punk single. While out of necessity Alan Horne and all at Postcard were making it up as they went along, there really was a will to succeed and get records into the chart by breaking out of an underground pop ghetto. Horne hated the underground he was forced to be part of. He was disparaging about and intent on irritating the pop establishment, underground and overground, even those there to help like John Peel and Rough Trade, stalwarts of the alternative pop world. Therein lies the dichotomy for Horne. He wanted to get on, but hated those he had to deal with. It’s something that never bothered his great hero Vic Godard. He just left everyone else to it. “He is merely miscast in a play. He would have made a perfect knight, in a different century, or a very good pagan prince in a time of heroes. He was born in the wrong era, on the wrong side of the river, with the ability to do anything and finding nothing he wants to do,” wrote S.E. 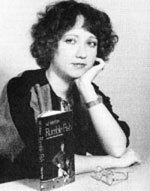 Hinton in her Rumblefish, which first appeared in 1976, at the same time as Subway Sect first appeared. She could have been writing about Subway Sect singer Vic Godard who was singing about being born in another age. 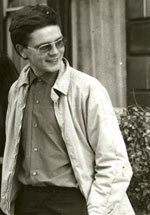 Vic’s early-‘80s vision of an inventive-MOR music with great lyrics particularly shaped the second generation of Postcard groups, Aztec Camera and Jazzateers, who believed that Radio Two could break down those barriers put up after ’76, and that Radio Two was where their songs should be played. On the C-81 Rough Trade/NME cassette compilation, Alan Horne compared his acts to different periods of the Velvet Underground. Vic Godard dedicated his version of 'Parallel Lines' on the tape to all those that hated Radio One. The earliest incarnation of the Jazzateers in particular, with Alison Gourlay singing, suggested a semi-acoustic group playing Velvet Underground ballads in a lounge bar, or Bacharach and David bossa numbers in a folk club, but sadly these songs sounding in that way never made it to vinyl. There is a story of Horne and the group getting lost in Soho en route to seeing Vic Godard and his Subway Sect perform at Bernard Rhodes’ Club Left, and stumbling across huge hero Kevin Rowland of Dexys Midnight Runners, and humbly asking for an autograph. Rowland’s own argumentative and obsessional nature, and puritanical prickliness echoed Horne’s own, and indeed they shared a mutual love of Bob Dylan’s mid-‘60s recordings. Rowland would repeatedly state Highway 61 Revisited moved him to tears. I abandoned these notes when Alan Horne recalled his Postcard label to life in the early 1990s for a series of beautifully packaged CD releases and attendant merchandise. This time around he would cast Postcard as the last of the punk independents. Horne stayed incredibly loyal to his old charges and loves. He even salvaged Vic Godard’s best ever recordings by releasing the End Of The Surrey People set.